Rose Brewer asks students what social injustices they have encountered at MSUM. Students face social justice problems everyday. It is crucial that universities address discrimination issues. Monday, Feb. 25, King Hall was filled with students and faculty members looking to address those issues. University of Minnesota- Twin Cities African-American and African studies professor and social activist Rose Brewer spoke to students about current inequalities in American universities. 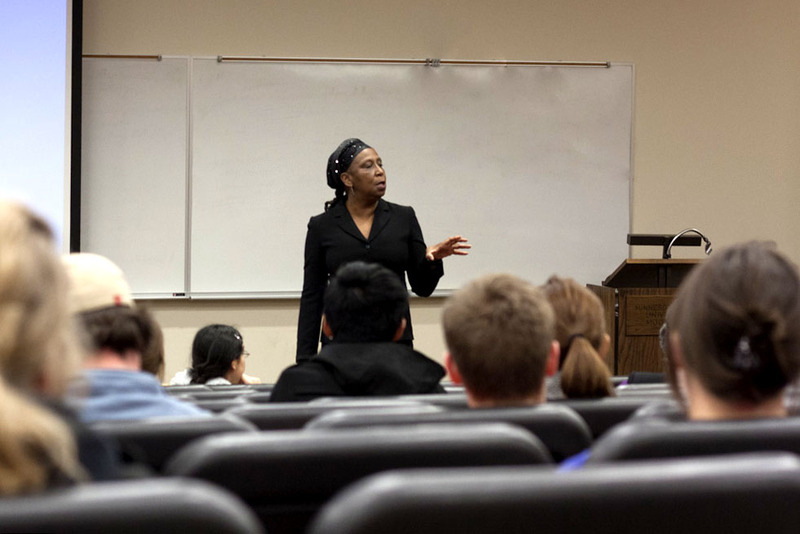 Her lecture titled, “Creating a socially just university: a critical discussion of race, gender and class,” provoked students to think about solutions to social injustices in their own lives. Brewer encouraged students not to be discouraged by seemingly unchangeable oppression. “Nothing is a totalizing system. Put yourself in a position to interrogate and push back,” Brewer said. Brewer spoke directly to students to find out about social justice issues at MSUM. The problems varied from parking policy changes to blatant discrimination. “It was inspiring how she spoke directly to the students. She asked specifically what needs to be changed on campus and provided students with the agency to make change,” said Raymond Rea, film production professor and lecture logistics coordinator. Students and faculty members were invited to a “continuing the conversation” luncheon the following Tuesday, for a one-on-one discussion with Brewer. Understanding intersectionality, the study of how race, class and gender work together on multiple and simultaneous levels to contribute to social inequality, was the heart of Brewer’s lecture. Brewer encouraged students to educate themselves about intersectionality and the problems it creates. She said that race, class and gender issues have deeply framed American history. Looking at these issues singularly is not enough. MSUM currently has many courses that teach intersectionality. Rea said that ideally, it would be taught in every department on campus. The issue of climbing tuition rates is at the top of Brewer’s list of economic offenses. Even though issues like tuition seem like a dead end, Brewer assures students that change is obtainable. “If you have the leadership and the students are willing to make a stand, any campus can be a catalytic source for change,” Brewer said. For Rea, Brewer’s lecture reinforced MSUM’s current equality efforts. “When someone who has gone into this work in such depth comes in from outside our campus it validates our work and the work of students,” Rea said. Brewer is a recipient of the Morse-Alumni Teaching Award for Teaching Excellence and Outstanding Contributions to Undergraduate Education as well as the African American Learning Resources Center Award for Teaching Excellence, among numerous other awards. She is a board member of Project South: Institute for Elimination of Poverty and Genocide. She has served on the board of United for a Fair Economy and is a founding member of Black Radical Congress. The Color of Wealth, her most recent co-authored book, received the Gustavus-Myers Book Award for best books on bigotry and human rights.